Deep-Sea Audio Recordings Reveal A Noisy Mariana Trench, Surprising Scientists : The Two-Way Instead of quiet, researchers hear sounds of earthquakes, ships, "the distinct moans of baleen whales" and a passing storm, nearly 7 miles deep in the Pacific. The sound of a magnitude-5 earthquake that hit near Challenger Deep in July of 2015. Researchers lowered a specially designed hydrophone mooring from a Coast Guard cutter and down into the Mariana Trench. The results surprised scientists from the National Oceanic and Atmospheric Administration and Oregon State University, who conducted the experiment. Instead of quiet, they heard sounds of earthquakes, ships, "the distinct moans of baleen whales and the overwhelming clamor of a category 4 typhoon that just happened to pass overhead," according to a release by Oregon State. Short clip of a baleen whale call recorded at Challenger Deep. The call mostly closes resembles a Bryde’s whale call. Sound of the propeller from a ship passing the Mariana Trench. The sounds give a new sense of what life is like nearly 7 miles below the ocean's surface. Working with the U.S. Coast Guard, the researchers sent a titanium-encased microphone to a depth of more than 36,000 feet, into the deepest part of the Mariana Trench known as the Challenger Deep. When it was retrieved, the microphone package's flash drive held recordings that were made over the course of three weeks last summer. Further surprising scientists, the recordings weren't merely of faint echoes — they were of clearly discernible sounds. "You would think that the deepest part of the ocean would be one of the quietest places on Earth," says chief scientist Robert Dziak of NOAA. "Yet there really is almost constant noise from both natural and man-made sources." 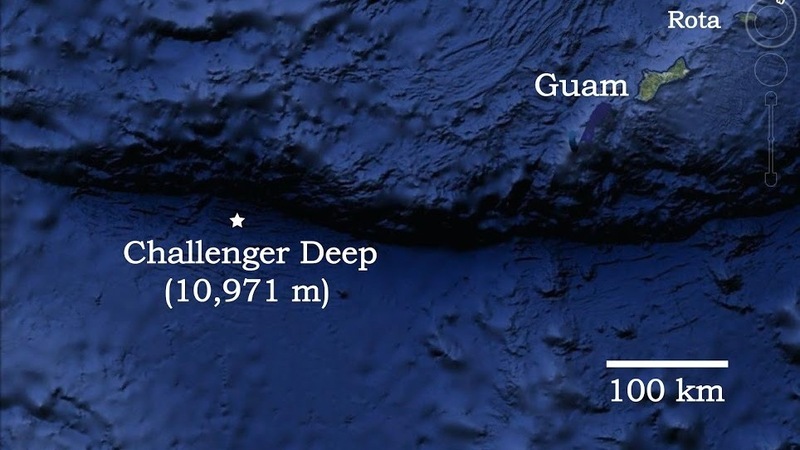 Explaining the prevalence of propeller whine in the recordings, Dziak notes that Challenger Deep is close to the commercial shipping hub of Guam. A map shows the location of the Pacific Ocean's Challenger Deep, in relation to Guam. 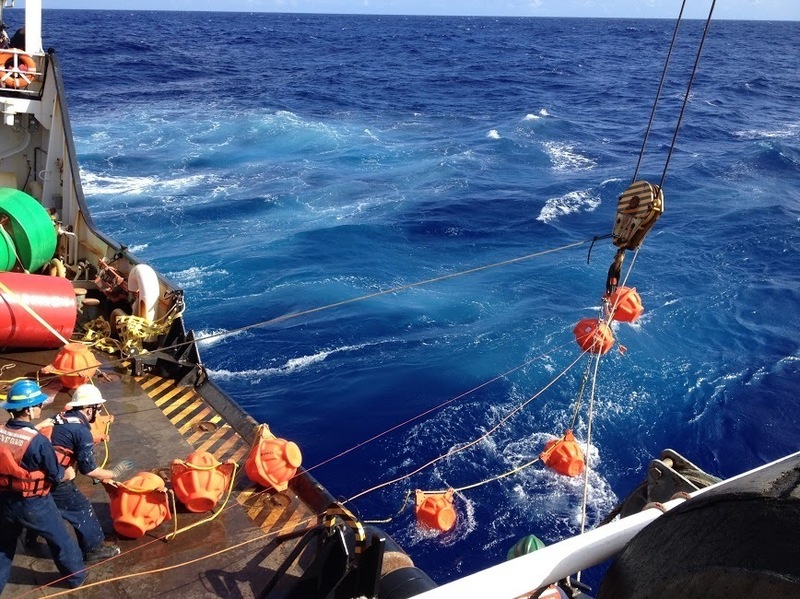 NOAA undertook the mission to help establish a baseline for ambient noise in the deepest part of the ocean. As Oregon Public Broadcasting notes, "Lots of additional research is happening along the West Coast to study possible impacts on whales and other marine creatures from increasing human-caused underwater noise." Before they could make the recordings, the researchers had to develop a hydrophone that was capable of surviving extreme pressure — in this case, more than 16,000 pounds per square inch. For comparison, NOAA says, the atmospheric pressure in the average home or office is less than 15 pounds PSI. When it was finally lowered, NOAA says, the ceramic hydrophone had to enter the depths at a relatively slow pace — 5 meters per second — to prevent it from imploding.